Discussion in '2001-2005 Explorer Sport Trac' started by 01Rockstar, June 29, 2011. I am looking for pics of black bush wacker fender flares on a white sport trac. I think that that would make my truck look awesome with my black rims and a spacer to make them stick out just a little bit. what you guys think? Looks great man !!! 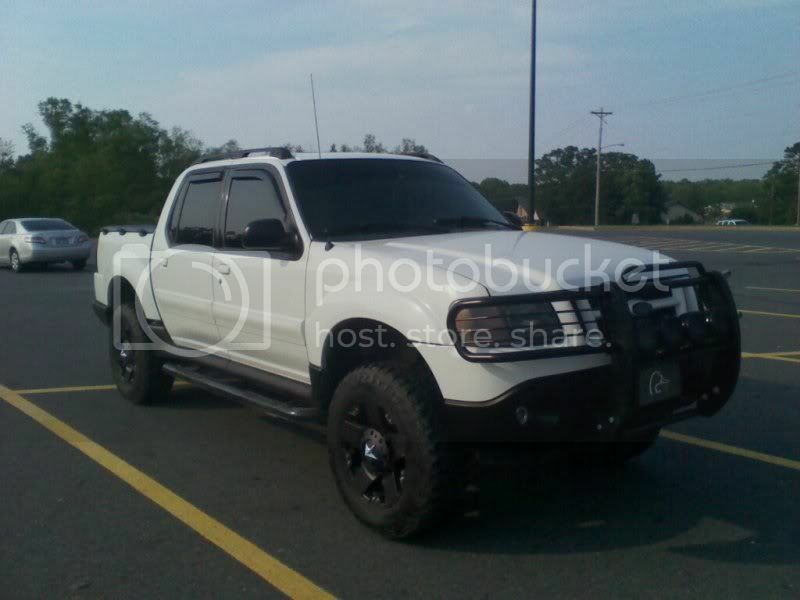 I'll upload some pictures of some Trac's with Bushwacker fender flares. Here ya go... these are pictures of members Trac's from a couple different sites that I saved for future references for mods. All I can say is, definitely paint them if you get them! It might look ok with the black rims and black cladding and bumpers. The ONLY thing that matters is how YOU like it Rock. I'm just an old-school purist. Twotonesam on the sport trac site might be selling his, he's the one with yhe blue trac pictured above, just a heads up. Yeah, you have to have at least 12.5" wide tires and some wheels to offset them out a bit otherwise they look a bit silly. Me, I like slinging mud. The inside of my truck has been so dirty at times it took me hours to clean it. Ain't no mud in Miami!!! Thats all we have, 30 minutes drive from my home is The Hump, The USA's most southern mudhole. Unfortunately rain season has started so I won't able to go much of anywhere out there until in dries out a bit in the fall, its just too deep for my truck. When the wife and I buy a house I will have a dedicated mud truck. I just threw up in my mouth a little after some of those pics. Maybe cheap but they look just right !! LOL, glad it's not just me! Indyhunter, I had a set of those on my '79 Scout II, I seriously miss that truck. Due to the ever so great "Rusty Jones" rustproof guarantee and Pittsburgh's love of road salt it is no longer with us. Wish I wouldve held on to the 345 V8 and 4speed, it would be a beast in my Trac. Oh well. Those are perfect, I think my buddy Gmanpaint has those and they look great.